A Globally Management, Marketing, Agency, Service and Production 4 A Long-term Mutual Beneficial Relationship! How Can I Establish A Joint Venture Investment Partnership With My Clients ? How Can I Finance The Expansion Of My Company ? How Can I Fortify The Equity Position Of My Company ? How Can I Finance The Expansion Of Our University ? How Can I Refinance My Hotel-Restaurant-Café (Ho-Re-Ca) ? How Can I Attract Investment Partners To Finance My New Invention ? How Can I Reduce My Investment Risks ? How Can I Establish A Joint Venture Partnership With A Financial Intermediary ? How Can I Attract Investment Partners To Finance My New Clinic ? How Can I Attract More Investment Partners To Finance My Real Estate Project ? How Can I Attract Investors To Finance My Projects ? Project Funding Within 100 Days! Do you own Venezuelan Bonds ? Do you want to earn high earnings with this bond? Is your bond posted on the Euro Clear? We can assist you to enroll into an associated High yield program. This opportunity offers ZEROS RISK to the Investors, the funds remains in account and never leaves owner’s control. Only the principal owner of FUNDS or/and ASSETS is considered as signatory. Client provides a compliance package dated within 3 days along with 1-15 and 21 Euroclear pages to show that the investor/investor’s company is the owner and beneficiary of the bond. Blocking will be done on Euroclear only. 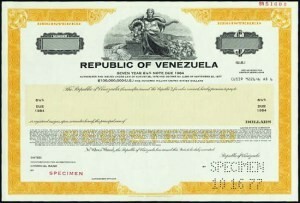 To get the Venezuelan bond into trade with a minimum 500M face value. SWIFT MT760 or MT542 Might Be Required. Upon your request we will submit draft compliance PKG, and other required initial documents to begin the process. Abbreviation: HYP – High Yield program.